Damien Escobar | Boundless - TheUrbanMusicScene.com | Music Reviews! 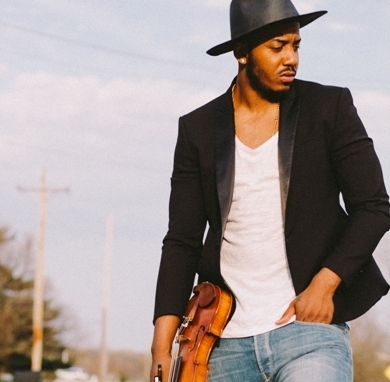 For a much gifted musician as a Julliard graduate while barely a teenager, Damien Escobar was ready to showcase the violin in a hip-hop/classical element with his brother on a weekly national TV talent search. Two years removed from their 2006 debut album, the autobiographical Struggle from the Subway to the Charts, Nuttin But Stringz placed third on NBC’s America’s Got Talent in 2008. From there, the brothers Escobar, Damien and Tourie, were ready to set the world on fire with even more media exposure, an appearance at the 2008 Olympic Games and Barrack Obama’s First Inauguration the following year. However, even a change of heart or change in circumstance can alter the road much traveled. Faced with depression and ironically living on the streets not so long ago, Damien Escobar was ready to reshape his career as a solo artist by scheduling impromptu street stage appearances and pitching his musical cause on Indiegogo. Once the word got out, social media exploded with many hits of his freestyle improvisations and several independent singles. Dubbed the violin crooner, Escobar’s single, “Freedom,” that topped the iTunes Hot 100 Top 10, eventually steered Escobar on his solo chapter and a renewed confidence of where his artistry was going. Following the debut full-length Sensual Melodies that concentrated on cover pieces, Boundless focuses on all original Escobar compositions – bathed in sonic orchestrations, including his initial single, “Get Up and Dance.” The multi-layered “Phoenix” opens Boundless with an ambient R&B soundtrack. “Mood Swings” unveils an international flair featuring the French rapper Disiz and Flamingo’esque rhythms along with electric piano and harp sprinkles. For those who dig a smooth jazz groove, “Night Drive” calmly blends old school R&B with brass fills. Then there’s “Get Up and Dance,” which steps away from Boundless’ mellower zone bringing some Soul Train attitude along with popping bass, hand clapping and an engaging accompanying video set in the roaring twenties. “Fuse” throws down some steady funk with Escobar plucking the violin strings on the climax, even if for a brief moment. The stripped down ballad, “A Winter Night in Boston,” reflects much elegance in a duet with acoustic guitar and lighter percussive track. Switching up from the urban flavors, the pulsating, bass resonating, “Lights” leans a bit more towards the rock/pop anthem. “Power” heads in a similar direction in exploring more of Escobar’s classical roots driven by kettle and bass drums. Now set to etch another musical trial in his still young career, Damien Escobar continues to make boundless strides on behalf of his solo venture. Four and three quarter stars out of five.